Home RoboMagellan What is Robomagellan? Robomagellan is one of the three robotics programs in the PVIT Club. Robomagellan culminates in an April robotics competition where all entered competing robots are completely autonomous – there can be no human interaction with the robots while they are competing. The goal of the entire competition is to have our robot navigate from a start point to an end point, and touch an orange traffic cone located at the end point. Throughout the course, there are various obstacles and a few bonus cones that decrease completion time (and thus increase our score). The only information we are given is the GPS coordinates of the cones. So, to successfully complete the course, our robot has to avoid obstacles (which can be trashcans, people, trees, stairs, etc) while at the same time searching for an orange traffic cone. We have been working on Robomagellan for two years, and last year was our first competition. 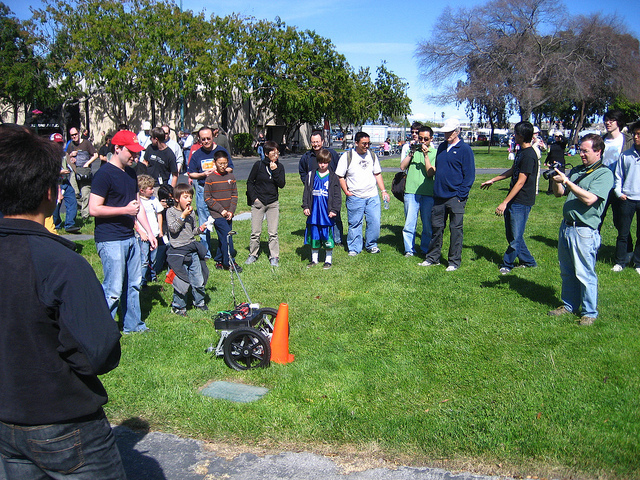 Most of the teams were college teams, including UCLA and UCSD’s robotics teams. We were one of two high schools competing. We did well, but have a lot of room for improvement! This year, we plan on using a laptop to do all of our computing, instead of individual micro controllers. This will enable us to have a more central and comprehensive code, and not have to split up tasks among different micro-controllers. Additionally, we are going to re-write all of our code in Python. All of our team members, even if they aren’t working directly on the programming, will learn how to code in the Python language. This is going to be an incredible year and we can’t wait to get it started!